The very end of fall semester 2016 saw the introduction of a little co-lab conference known as Storyfest. The purpose of Storyfest was to bring professors and students together to discuss the question: “what makes a good story?” Over the course of November 30th to December 2nd, lectures, group panels and films aimed to answer just that. Storyfest 2016 was filled to the brim with beautiful and intelligent student work—some projects even having developed over the entirety of the fall semester. This year’s Storyfest even featured well-beloved author Aminatta Forna (The Hired Man and several other works) along with filmmakers Scott MacLeod and Mike Burns (The Water of Life). In my opinion, one of the largest benefits of Storyfest (and similar conferences) is that it allows the English major—along with other creative majors—into the public eye. I think it is fair to say that while class discussions bring the majority of students together, being an English major is a fairly solitary major. Storyfest remarkably brings both majors and non-English majors into the same room and opens up a conversation via lectures or group panels. By doing so, it creates a cross current of opportunity and understanding. With each co-lab, the end of semester conferences continue to grow and improve. I look forward to what may come in the spring (potentially another Storyfest?) and I hope to see you all there—whether it be to present or part of the audience. Listed below (with descriptions!) are the Humanities topic courses for Spring 2017. For full English department course listings, see MyCampus’s Schedule Planner. This course is designed to teach students strategies for writing entertaining, provocative, and persuasive audio essays for broadcast, internet, or internet radio. Audio essays explore topics using spoken text, audio interviews, archival recordings, music, environmental sounds, and sound effects. They can be structured using the conventions of argument and evidence, narrative devices, as well as poetic and experimental structures. As we will see, the audio form offers the essayist a fascinating mix of constraints and opportunities, much in the same way that film or photography does. Voices and sounds are full of intimate presence, are in fact the very signs of presence, and can provoke in unexpected ways. In radio, sometimes a sound is worth a thousand pictures. The emphasis of the course will be on research and writing strategies, but you will also learn basic audio recording and production. No prior experience in radio or digital audio is required. This course will look at the process of adapting literature to film, with an emphasis on the films of Stanley Kubrick. Working from books and short stories by a diverse group of contemporary authors, Kubrick crafted films that stand on their own as works of film literature. Throughout the course we will read original works, adapted screenplays, and view the films while considering the differences between these two storytelling mediums and reflecting on the peculiar challenges of turning words into pictures. The course will require some viewing of films outside of class. This course will be an in-depth study of the works of the English poet John Milton (1608-1674). A large portion of the semester will be devoted to careful reading of Paradise Lost (1667, 1674), Milton’s beautiful and complex epic poem about the fall of Adam and Eve, but we will also read “L’Allegro” and “Il Penseroso” (1631), Lycidas (1638), Of Education (1641), Aereopagitica (1641), Paradise Regained (1671), Samson Agonistes (1671), and other works. The course is open to interested students in all majors: the only prerequisite is ENG 100, and no previous experience with Milton or with traditional English literature is required. Primary readings in literary and cultural studies theory will provide conceptual frameworks for offering critical commentary on contemporary culture (literature, film, television, music, etc.). That commentary will take the form of blog posts, reviews, recaps, tweets, podcasts, etc. In this course, we will consider the kind of novel which, in Robert Alter’s words, “systematically flaunts its own condition of artifice and…by so doing probes into the problematic relationship between real-seeming artifice and reality.” By the novel’s “condition of artifice,” Alter means its status as an artificial, constructed thing, a work of art. Some novels try to suppress awareness of their artificial condition in order to create an intense mimetic illusion. By contrast, novels in the self-conscious tradition we will be studying “flaunt” this condition in a playful way, exposing and subverting conventions, imitating and parodying other works of art, and drawing attention to their own multiple stylistic textures. The reading list will include Cervante’s Don Quixote, Sterne’s Tristram Shandy, Austen’s Northanger Abbey, Nabokov’s Pale Fire, and Calvino’s If on a Winter’s Night a Traveler. Prerequisite(s): One 300-level ENG literature course other than ENG 300. Photo credit to the Epic Reads website. 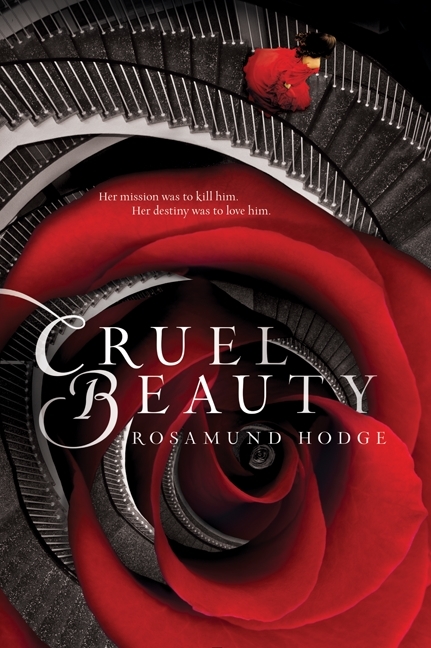 In 2014, HarperCollins published Rosamund Hodge’s Cruel Beauty as part of their Epic Reads program. Cruel Beauty, Hodge’s debut novel, is slated among other Young-Adult powerhouses such as the ever popular Divergent series by Veronica Roth and Neil Gaiman’s Coraline. Marketed as a fairytale retelling meets Greek mythology, Cruel Beauty delivers a rich world of magic and horror, ensnaring readers from the start and refusing to let go until its conclusion. Cruel Beauty tells the story of Nyx, a seventeen year old girl betrothed to Ignifix, the evil immortal ruler of the land. Due to the bargain her father struck with Ignifix before her birth, Nyx has spent her life training to do just one thing: murder Ignifix and thus break the curse that has shrouded the kingdom in chaos for hundreds of years. Knowing that she must either kill him or die trying like the wives before her, Nyx becomes entangled in a mystery that has haunted the castle since the very curse was put in place. While adjusting to life with a sarcastic trickster demon, she discovers that although Ignifix is very much the monster of nightmares, he is also something more than just that; he’s someone who understands her. Nyx and Ignifix’s understanding of one another gives cause to a budding romance that can only end in disaster and death. Nyx must make the choice between what is her duty and what she wants. Overall, Cruel Beauty does justice to both the “Beauty and the Beast” tale as well as the mythos of Cupid and Psyche. Hodge’s writing is spectacular, both haunting and encaptivating. She knows how to walk the fine line between having your audience love your characters and having your audience hate your characters. Ignifix, the demon taking the place of both Beast and Cupid, is extremely well-developed. By the end of the novel it is easy to be in love with him as a character despite the fact that he’s more than willing to murder without batting an eye. Hodge uses the romance in the novel well, keeping it as a starting point for Nyx and Ignifix’s character development, rather than turning it into the novel’s sole focus. Cruel Beauty is Nyx’s coming of age story with a romantic element, not a romance novel with Nyx as the title character. This distinction is what sets Hodge’s novel apart from similar fairytale retellings. In the course of the novel we, as readers, discover that Ignifix is not the only monster in the castle but perhaps Nyx is one too. As a way of breaking the trope of Beauty always being kind, Hodge has Nyx often linger on the angered thought that it should be her sister in Ignifix’s castle, not herself. She hates her family, particularly her father, for betraying her and selling her to this fate. Nyx often feels as if her family never loved her and kept themselves at a distance viewing her simply as the sacrificial lamb that would break the curse and not a true member of the family. During a heated argument, Ignifix says to her: “You fought and fought to keep all the cruelty locked up in your head, and for what? None of them ever loved you, because none of them ever knew you.” (203). Ignifix becomes the only one who understands Nyx and that does not shy away from her own monstrous qualities. Hodge breaks away from the classic archetypes and asks the question: why can the beauty also not be the beast? Although Cruel Beauty is Hodge’s debut novel, it reads as if it was written by a seasoned author. The novel has many plot twists, some easy to guess from the start and others that take place in the last thirty pages that leave you wanting for more. According to the author, she does not plan for a direct sequel to Cruel Beauty but rather a series of companion novels, each focusing on a different fairytale set in the same universe as Cruel Beauty. Out now is Gilded Ashes, a Cinderella novella, and come May, Hodge’s second full-length novel Crimson Bound—a Red Riding Hood retelling—will be published. If you enjoy retellings of fairytales and mythology or you’re just a fan of fantasy that features complex world-building and trickster demons, I strongly suggest checking out Cruel Beauty. You’ll be in for an adventure you won’t soon forget. Confession time—I am an avid watcher of historical dramas. Unfortunately, there is a common trend among these shows that has turned me into a hesitant viewer: the lack of development for women. Now, to be clear, I’ve never expected a show (at least one that is loosely based on a previous time period) to go out of its way to place women in roles that they would otherwise not have been in. That being said, just because you’re basing your show on the past doesn’t mean you can’t use your female characters just as diversely as your male ones. Which is why I’m glad that I stumbled across History Channel’s show called Vikings. Not only is the show excellent at storytelling, cinematography, and a semi-accurate account of how the actual Vikings were, it has introduced me to Lagertha Lothbrok a.k.a. medieval Wonder Woman (minus the alien part). A quick introduction to the society that Vikings take place in for those that may need it. The Vikings in the show were a society known for their raiding culture. For most of the year they were farmers, but come springtime men were destined for adventure. They would pack up their ships, follow their leader, and head off to distance lands to pillage. This set up would make it quite easy for the writers of Vikings to follow the binary that Jeffery Brown establishes in his book Dangerous Curves. He says, “[this] situates men as active, women as passive—men as violent, women as having violence done to them.” (21). In this case, men would be the warriors, creating violence in far off lands while the women were at home always act the risk of violence coming to them. While these set ups do occur in Vikings, there is always a twist and that’s where Lagertha Lothbrok comes in. Lagertha’s everything that is to be expected of her, dutiful mother and wife, but she goes a step further, she’s one of the most famous shield maidens of her time. 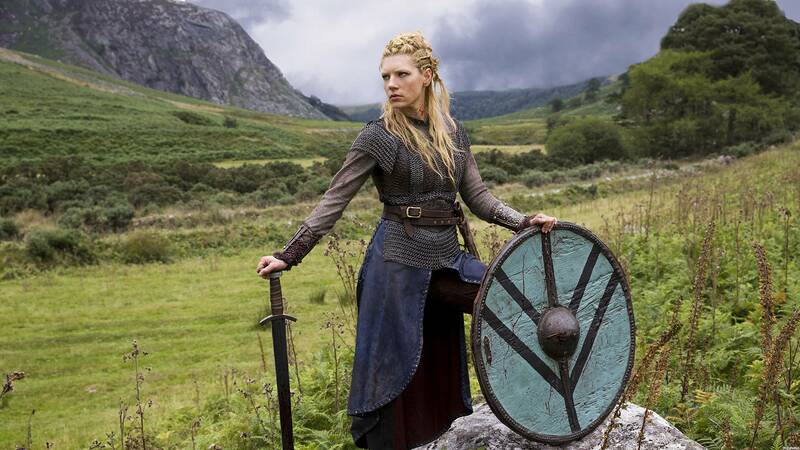 If you’re not sure what a shield maiden is, they’re essentially female warriors that fought with their male counterparts on the field, and were expected to be given just as much respect as the men. She’s ruthless on the battlefield and one of the running jokes on the show is that she’s saved her husband’s life countless times. Lagertha is thus one of the show’s most prominent action heroes but, as Brown discusses in Dangerous Curves, she is not simply a man in female clothing. There is no denying that Lagertha is subjected to the male gaze quite often but like Brown notes her body is not filmed in this manner as a “mere sexual commodity” but also as “a body designed to be functional.” (25). If you look at her shield maiden attire (pictured below) you can see that she is covered in protective gear. Unlike many similar female action heroes, her battle armor is actually practical. Her chest and stomach are covered in chainmail, her wrists in bracers and under her dress she’s wearing protective leggings. While in this still her hair is pictured as free flowing toward the bottom, in most battle scenes it is shown to be tied back, keeping it out of her face. By showing her to be holding a sword (and her skill at wielding one), Lagertha has “usurped a particular phallic means of power.” (31). Lagertha goes on to illustrate her skill in warfare by what Brown refers to as “the second most emblematic sign of the action heroine’s masculinized persona,” physical strength. In the pilot of the series, Lagertha and her daughter, Gyda, are left behind while her husband and son go to trade. Referring back to Brown’s claim of the gender binary, this scene is set up for both women to have violence done to them. Two strange men enter the Lothbrok’s workshop, demand that Lagertha wait on them or else they’ll do terrible things to her daughter and herself. She refuses and one of the men say, “I don’t want to kill you, woman.” Lagertha, subtly lifting one of the swords from the fire, hisses, “You couldn’t kill me if you tried for a hundred years.” They fight, the pair of men and Lagertha, and they’re depicted as equals. She eventually wins and the men barely hurry off with their lives (one having been stabbed in the throat with a hook and the other in the gut with a sword). This is just one of hundreds of moments of Lagertha illustrating her physical strength being on-par with the men surrounding her. Despite all this, Lagertha is still shown to be feminine. She is a loving mother who protects both her son and daughter with the fierceness of a lioness. When later in the series her second husband threatens to have her son killed (said husband has also been hurting her), Lagertha murders him without remorse. This is also a moment of her overcoming gender roles as the murder of said husband leads to her becoming Jarl (lord) of the town. However, her aggressive nature with her second husband cannot be an accurate depiction of her as wife, as with her first husband, Ragnar, she was incredibly loving and wanted to do what would be right by him (although she never did allow him to order her about). When in discussion with those that could be considered traitors, she often uses her femininity as a means of gaining information, flirting with the men or pretending to upset before she walks off to report back. As Brown says, “the conscious manipulation of traditional perceptions of female characters as weak” has become a way for female characters to instead be strong. By exploiting what the men around her think of her, Lagertha can be both spy and warrior. From the start, Lagertha Lothbrok has always been what I like to refer to as a medieval feminist. She acts as an idol for the young women in the series, with many of them saying that they would someday like to become like Lagertha. She never tolerates violence to be done to her, both in the physical and emotional sense, and by that she steals the role of action hero out from under the male character’s feet. She is both strong and soft all rolled into one—the female character development that more historical dramas need.